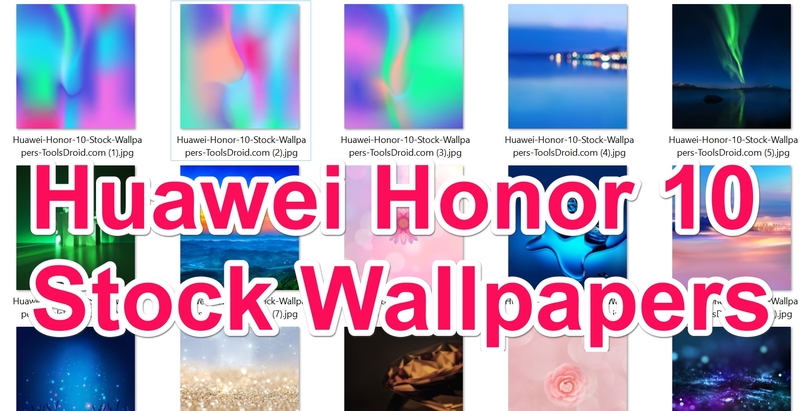 Huawei Honor 10 Stock Wallpapers: Here we are with yet another collection of Stock Android device wallpapers. Today’s collection is the stock or official wallpapers of the newly announced Huawei Honor 10. This new super sleek android phone with the iPhone X like Notch was announced around a week ago. There are 15 better then Full-HD Wallpapers Full HD+ (2280×1080 pixel) in the Zip format for download. You can also find tons of other wallpapers in our Wallpapers Category. The design of the Honor 10 isn’t much different the the Huawei P20 (Wallpapers here). You can see the same iPhone X like notch on both devices. With classic shinny glaring glass on the back of both devices. The only difference here is the dual camera on the back of Honr 10 while the P20 comes with another huge camera in addition to the standard Dual camera lens mounted on the back of the device. The Huawei Honor 10 comes in High-End mobile category. You can find the Huawei’s very own Hisilicon Kirin 970 processor adding the Octa-core (4×2.4 GHz Cortex-A73 & 4×1.8 GHz Cortex-A53). This is supported with the Mali-G72 MP12 GPU and with either 6 GB or 4 GB of RAM on different variants. Here are the 15 Full HD Official Walls from the latest Honor 10 smartphone. Download and enjoy these official Honor 10Lite backgrounds on any device with a bigger display. This is the latest smartphone by Vivo. The smartphone comes with gigantic 6.0 inch display with the pre described resolution. The official Wallpapers thus looks awesome on this bright IPS LCD display. Xiaomi Black Shark Stock Wallpapers. Xiaomi Mi Mix 2S Stock Wallpapers. Asus Zenfone 5 Lite Stock Wallpapers. You can also download these wallpapers from the Huawei Honor 10 Stock Wallpapers.Zip link given below.